Green Star Products, Inc., previous post, (OTC: GSPI), announced Friday that it has completed Phase I of its 40,000 liter microalgae demonstration facility and has been successful in controlling the most important variables in algae production, i.e. temperature of water in large systems, salinity (salt content), evaporation, pH (acidity-alkalinity) and most of all initial costs of construction. In summary, GSPI has developed the field expertise to build and operate the patent pending, proprietary Hybrid Algae Production System (HAPS), a cross between an open and closed pond system. 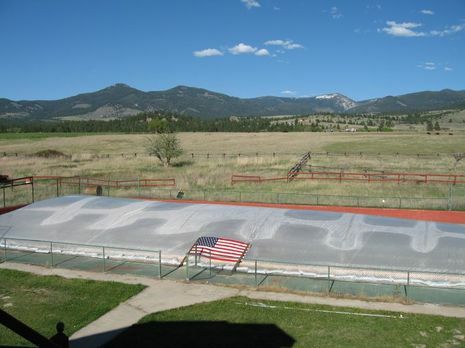 The demonstration, prototype facility is located in Montana with an individual pond capacity of 40,000 liters, which can easily be scaled up to larger systems and acreage. Joseph LaStella, President of GSPI, explains, "The industry hurdles are mainly associated with costs of construction of algae farms and process systems that can economically control the growth environment of the algae. This is exactly the purpose of GSPI's Phase I demonstration algae facility." ● All attempts to use closed bioreactors for algae fuel crops have failed. Closed bioreactors are too costly, although they do have a place as a breeder facility (hatchery) for larger systems. Evaporation, wind blowing dust particles into ponds and rain causing changes in salinity and pH, which affect growth of algae. The GSPI (licensed) algae system is a Hybrid Algae Production System (HAPS) that incorporates the controlled environment of the closed photobioreactors coupled with inexpensive construction technology to reduce the cost to a level very close to the open pond systems. Temperature and light control are the two most important parameters identified by industry reports and must be accomplished at an effective low cost. The next important parameter to be controlled is salinity. Open ponds continually evaporate large quantities of water and leave salt behind. Salt content continually increases and adversely affects the growth of the algae and must eventually be disposed of and exchanged with new water and algae. The GSPI enclosed HAPS have been designed to be constructed utilizing relatively inexpensive local materials anywhere in the world. The 40,000-liter pond was assembled, with a four-man crew, in less than 12 hours after the necessary construction materials were onsite. During the test period, varied weather conditions occurred in Montana with temperatures varying from 34°F to 82°F, winds up to 30 mph, heavy rains, some snow, cloudy and sunny periods – all occurred during this time. However, with the enclosed HAPS, several typical uncontrolled open-pond parameters were dramatically improved. For example, pond temperatures were 30°F to 36°F higher than the outside temperature on cold nights well above the optimum minimum growing temperature for algae of 64°F. The HAPS also offer additional inexpensive external temperature controls, if necessary, to cool ponds in the hot summer and heat ponds in winter conditions, during extended sunless days, to maintain maximum growth conditions. Algae cannot tolerate direct sunlight and they tend to grow best receiving 25% to 50% of direct sunlight. GSPI’s HAPS enclosed ponds have a partial light barrier with the enclosed material to promote optimum light conditions for algae photosynthesis. GSPI’s HAPS ponds do not evaporate the water and can maintain optimum salinity levels for long periods of time. Many suitable high-lipid (oil) algae species have been cultivated and already exits to produce the First Generation of sustainable energy farms. Present available algae species can produce 4,000 gallons of oil per acre each year, which is 50 times greater than the oil yield from oilseed crops such as soybean or canola crops. Recent news stories have publish the fact that the world is already experiencing significant increases in food prices because oil crops compete with food crops (Reuters May 8, 2007 – “United Nations tackles sustainable bioenergy growth”). Algae farms, on the other hand, do not compete with food crops. Algae may be the only long-term feedstock solution for biodiesel production. “Microalgae systems use far less water than traditional oilseed crops. Land is hardly a limitation. Two hundred thousand hectares (less than 0.1% of climatically suitable land areas in the U.S.) could produce one quad of fuel. Thus, though the technology faces many R&D hurdles before it can be practicable, it is clear that resource limitations are not an argument against the technology." In summary, GSPI claims that it has already addressed the main causes of failures of other systems and they are now ready to inoculate the first HAPS’ pond with high-lipid (oil) producing algae. Green Star Products, Inc. is a company dedicated to creating innovative cost-effective products to improve the quality of life and clean up the environment. Green Star Products and its Consortium are involved in the production of renewable clean-burning biodiesel and other products, including lubricants, additives and devices that reduce emissions and improve fuel economy in vehicles, machinery and power plants. GSPI still has many major steps to demonstrate before their HAPS can be said ready to work. In my mind these initial test, although required, are trivial compared to operating a system that is growing algae. The must demonstrated that 1) they can keep the system adequately mixed so that the algae is fairly evenly distributed over the pond, 2) they can inject the CO2 into the pond and distribute it evenly without pressurizing the enclosure or releasing significant amounts to the atmosphere and 3) they must demonstrate that they can efficiently harvest the algae without losing significant amounts of water and still maintain a stable environment for growing the water. I assume that after that the pressing of the remaining water out of the algae and converting it to biodiesel are relatively straight foreword tasks. Looking at their 2006 financials the question must be raised as to how they going to provide the money required for these tasks. They have received a $10.8 million order, plus royalties, announced Nov. 13, 2006, for 90 of biodiesel reactors and control systems with DeBeers, scheduled for delivery over 18 months from the date of order, which was received subsequent to the 2006 statements. More scammin'. 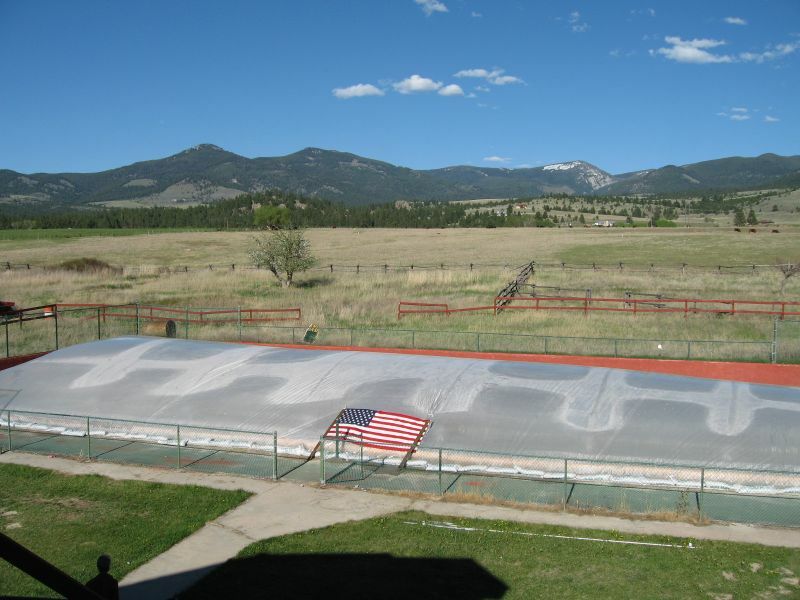 Why build an algae farm in Montana? Algae grows faster with less sunlight? Don't they mean more diffuse sunlight? Check out the DeBeers scam on The Oil Drum. This covered pool that has so far only stored heat is most likely located in Montana so bilked investors in South Africa can't get anywhere near it. From the article in The Oil Drum on the DeBeers project it looks like the polycarbonate tubing they wanted to use for closed systems turned out to be too expensive. The initial cost yielded a 50 year payback and the tubes need replacement due to UV degradation in 10 to 15 years. This covered pool scam would seem to be nothing more than a way around that cost for the con men running this scheme. If the theoretical limit of photosynthesis is limited to 11% solar efficiency. Then why are we even looking at Algae as compared to printable solar panels? The fundamentals for this process are all very positive. It seems only a matter of time until Green Star or someone else makes it work. The potential for algae is undeniable. Management of large processes of "cultures" such as this have been successful in the treatment of waste sewage for years. "Then why are we even looking at Algae as compared to printable solar panels?" Grey, I think there will always be a need for some liquid type fuels for aviation, the manufacturer of plastics, etc. Oil from algea can be made into a "crude oil" from which derivatives can be extracted or formulated. The only way you can get jetfuel out of biomass is by gasifying it using Fischer Trophe. Mix em together, and presto, you got liquid fuel. All with solar tech which is far more effecient than biomass solar energy. But why would we even need to go that far? Oil may be getting more scarce, but it's not like we're running on empty anytime soon. I agree that crude oil is plentiful and will be around for many years. The snowload on that pool cover seems problematic. Not only would it likely collapse, the melting snow would lower the temperature of the algae pond and the shade would stop the growth. I like algae biodiesel, just not these companies purporting to be developing this technology. It could be especially effective coupled with biogas digestors and solid oxide fuel cell/turbines. The biogas feeds the fuel cells, the cO2 from the fuel cells feeds the algae, then the biodiesel is removed from the algae leaving cellulose powder that can feed the fuel cells. Manure, garbage, farm waste, and biomass can be used in the biodigestor as feed stock to produce the biogas. Organic fertilizer is a valuable byproduct. The organic fertilizer replaces fossil based fertilizer that emits a lot of GHG in production. And soil fertilized with the organic fertilizer will store GHG carbon out of the atmosphere, where chemical fertilizer has depleted the soil of carbon storing organic matter. Restoring the huge carbon sink effect of agricultural land lost to chemical farming. Well there's also a lot of Greenhouse benefits to be had by turning "waste biomass" into charcoal fertilizer. It doesn't readily decompose into N2O and CH4. And it replaces fertilizers that otherwise would be petroleum based. What about the CO2 costs? Compressed CO2 is fairly expensive. Unless direct CO2 from power plants or CO2 extracted from the air is used, the whole scheme is a useless waste of money. As it stands, the only dried blue green algae sold is the painfully expensive stuff sold in health food stores. Perhaps sterilized air could be bubbled through the algae tanks. That's why it's best to use the algae solar biofuel setup with a biogas digestor and fuel cell. The CO2 from the fuel cell feeds the algae. The beauty of the biogas digestor is that it accepts biomass, manure, food waste, and turns it all into biogas and organic fertilizer. Other schemes can't mix the different waste streams in the same system. The organic fertilizer replaces fossil fuel based fertilizer that releases cO2 in production and when it is used on soil. this CO2 release happens in two ways. the chemical fertilizer breaks down organic matter in the soil that acts as a carbon sink. It also breaks down carbon sink organic matter in wetlands when it runs off the field. That's three major sources of cO2 and methane (23 times worse as a gHG than cO2) from chemical fertilizer, avoided by using organic fertilizer. Furthermore the organic fertilizer builds the soil ecosystem and turns it back into a natural carbon sink. Prairie soil stores 1.8 tons of CO2 per year per acre. It was 20+ feet thick when settlers busted the sod for farming. Now it is mostly an inert growing medium for chemical farming laced with toxins and ready to form a huge dustbowl with the next GHG caused drought cycle. These various savings of gHGs and sequestration of cO2 out of the atmosphere make this system the best by far. And non-toxic organic, good tasting, high quality food maybe the best byproduct. People might actually eat more vegetables and live longer, healthier, and happier lives if those veggies tasted like they used to 40 years ago. Eaten a raw tomato from a store lately? Then you know what I mean. There's quite a bit of speculation on Algae's potential from rather credible sources. There's also the point that all the biofuels besides BESIDES Algae would be even worse than Oil, and cost billions of dollars to do virtually nothing in reducing our oil consumption, air pollution, or CO2 emmisions. Infact it could quite easily make things worse. Using biomass charcoal to replace oil based fertilizers, now thats great. But theres no reason we can't already do that right now without algae. The terra preda sequestration / fertilizer strategy is the best way for biomass processing schemes to become net carbon negative - a wonderful capability. The concept of collocating the biomass reactor with a biodiesel burning generator (perhaps a small turbine) gives rise to all sorts of tunable synergies: generator heat and CO2 are inputs to the reactor and the algae. O2 and biodiesel from the algae feeds the generator. The aggregate emits air - and the rest is slow pyrolyzed to char and then amoniated to make low run-off fertilizer - a dream com true. I sure hope someone like GSPI figures out how to harvest algae in its asymtotic growth phase w/o killing the small criters - that appears to be the key next step. Green Star's algae plan is the only one that makes sense. Every high-tech trick has been tried with millions of dollars behind nearly every one. GSPI's design is simple and addresses the process variables for maintaining high growth curves. The "strain" multiplies rapidly and has fair body fat. The leftover protein makes great animal feed. The process makes oxygen. The Montana trial showed production in extreme environments. Low cost and robust process design are the keys to success. Bravo GSPI. I have read that The beauty of the biogas digestor is that it accepts biomass, manure, food waste, and turns it all into biogas and organic fertilizer. Other schemes can't mix the different waste streams in the same system. What capacity of energy they are going to get from this pound? What purpose/s this energy will serve? Lubechem International introduces a wide range of very high performance petroleum additives, based on components technology. The government needs to raise centers in every community for recycling different materials that people waste and use it to create "greener and cleaner" environment. Great article, I think we should aim to make all kind of wastes bio-recycled.